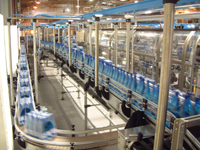 Pack conveyor comes in many types to ensure optimum efficiency and avoid pack damage. Crate conveyor – chains are generally manufactured in stainless iron (magnetic) / stainless steel (non-magnetic). Pack Conveyor for Crates, cartons and shrink-wrapped trays – gravity, power roller, zero pressure conveyor and belt conveyors. The pack conveyors are manufactured in standard length modules from single width slats to multiple width slats dependent upon application. The systems are designed around well-proven technology and drawn from 50 years of experience in the conveying field. Pack conveyor speeds and accumulations are derived from formulae gained from experience in handling crates, cartons, shrink wrapped trays etc. 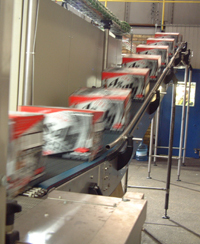 • Multipack and carton laning:- this can be either with a moving arm type unit or a platen type unit. The pallet type units are programmable and therefore very flexible. This allows a single or twin infeed being split to twin lane or triple lane or quadruple lane on a continuous basis. 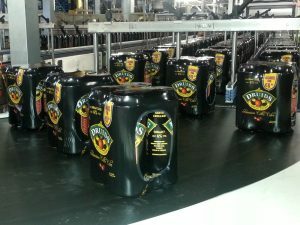 This is especially useful when feeding 2×2 multipacks to a shrinkwrapper for final packaging with 24 bottles or cans in a tray. In-line pack turning; this can either be differential slat chains or a fixed bar. Also combined units (LGV + AGV) are available. One application Enterprise completed was a pallet transfer where the pallet left the factory went over a bridge and arrived in a separate warehouse!